Sticker albums may not have been exclusive to the 1980’s, indeed they first appeared in the 1970’s and are still available today, but they’re one of those things that you remember about growing up. Most people probably had a phase during their childhood of finding these things the coolest idea ever, before they realised that actually completing one of the damn things was often near impossible. They were generally made by an Italian company called Panini, although in recent times another company called Merlin has also been getting in on the act. The premise is simple enough. You buy an album about a particular subject, most of which were either film or cartoon tie-ins or something to do with football. This album is full of numbered rectangles, and in order to populate them you had to buy stickers which came in randomly selected packs of six. Initially all was well, as the entire album was empty so every sticker had a place to go. However, once you were getting on for half way through the collection the number of “doubles” (or “swapsies” as we called them) started to soar. The idea was you could swap the stickers with your mates, but of course this only works if your mates are collecting the same album as you are. 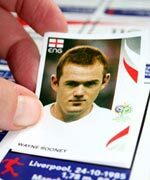 As you can tell this was an excellent exercise in sales and marketing for Panini, especially as they would only let you order the exact stickers you needed once you got within 20 or so stickers of completing the album. Until then it was either swap with your friends, spend more and more on stickers, or call it a day and give up. In most cases the stickers were stand alone images, but there were also several pages which needed multiple stickers to be placed next to each other to make a single larger picture. This was a good idea in principle, but variations in colour due to the printing process meant things didn’t always match up very well, and because you stuck the stickers in as you got them, the seams never quite matched up properly. Football always seemed to be a particularly popular subject for the albums, with an album being produced each year covering all the various teams in every league with mugshots of every player. In World Cup years there was also the obligatory tie-in with all the international team line ups. I remember trying to complete at least three of these albums. I definitely had an E.T. one which I managed to complete (but only because my sister was collecting it too so we had someone else to swap with), and also one for the Disney animated film The Black Cauldron (which bizarrely enough I never actually remember seeing). I also had a massive one which was about Prehistoric Animals, and my sister had one based around the film of Annie. I remember this because it became a bit of a running joke that every packet of stickers for this album had a picture of one particular little girl dancing with her arms stuck out like an airplane. This entry is filed under Books and Magazines	and was posted on January 16th, 2008. You can follow any responses to this entry through the RSS 2.0 feed. You can leave a response, or trackback from your own site. That’s right, they did no special metallic stickers didn’t they. My nephew has a current football sticker album and I was surprised to see that they’ve started splitting each sticker in two to put two different footballers mugshots on.